Want to see the classic city sites? This is your tour! We'll hit up as many of them as possible, from the Rocky Steps to the Liberty Bell to Rittenhouse Park. We'll be riding through some hidden gems in the city along our way. We cover about 10 miles and there are about a dozen stops. Here's your chance to learn about one of the nation's largest urban parks. Together, we'll explore Boathouse Row, the Philadelphia Zoo, Memorial Hall and the Centennial Exposition buildings, the Japanese Tea House and the Horticulture Center, Belmont Plateau and more. A great mix of history and riding, this tour is rated "moderate" due to a couple of hills along the way. A partnership with See Philly Run. A guided running and biking tour through Center City and Fairmount Park with informative breaks. Explore the "hidden river" and the lower parts of Fairmount Park on dedicated bike paths. We'll equip you with bike lights so we can ride past sunset and take in the iconic lights of Boathouse Row, plus great views of the city skyline and West Philadelphia landmarks. 9-10 miles of flat riding. Whether you want a private tour for two or a custom tour for 20, we can accommodate you! We've given tours for bachelorette parties, corporate retreats, and couple's anniversaries. 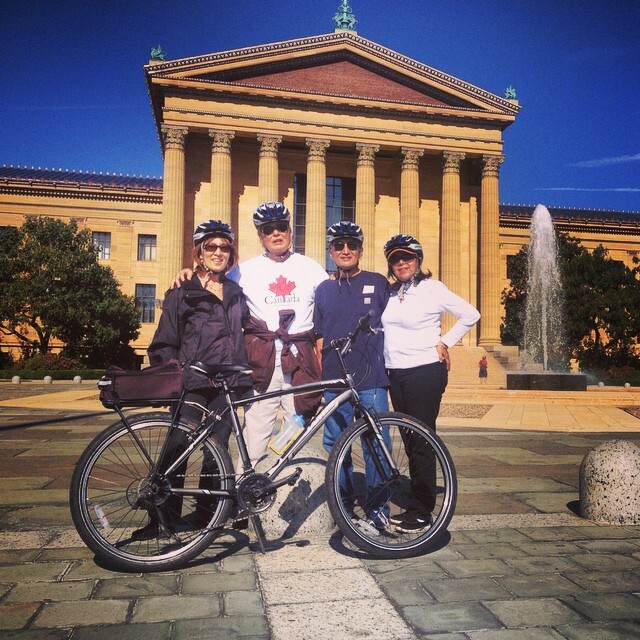 Call 267-521-2150 or send an email to fun@phillybiketours.com with all pertinent information and we'll get back to you! All tours include a bicycle, helmet, and water!